The Shangri-La Resort is Preserved in Time (and has magnificent pie to boot). Ever want to step back in time and experience the 1950s? 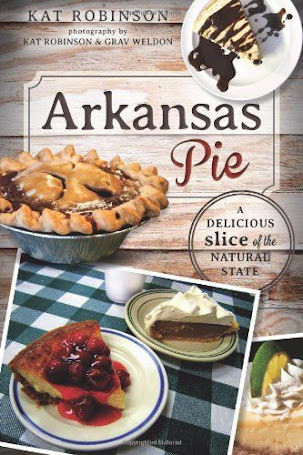 Arkansas's version of A Summer Place sits along the south shore of Lake Ouachita, and its cafe is the dominion of one of Arkansas's best and most experienced pie makers. Let's check out the Shangri-La. Mrs. Varine Carr told me herself that the Shangri-La opened in 1956, and that she was there that day. When I joked that she must have been about three, she laughed, stopped and said "no." Daniel Maurice and Louise Mowbray Hunter opened the Shangri-La Resort just after Blakely Dam was completed to hold in Lake Ouachita. 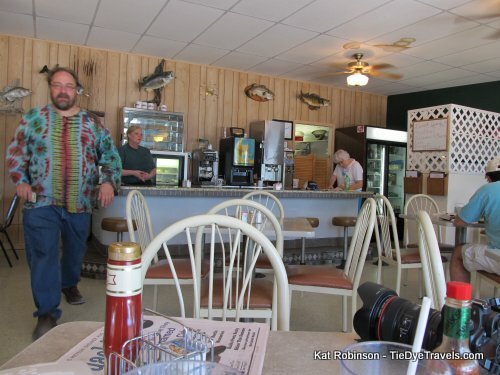 They started out with six motel rooms and two cabins and expanded over the years. From what I've been told, Austin and Varine Carr came on about a month before the resort was opened - Austin, as the carpenter, built many of the buildings at the resort. The Carrs became part owners of the resort in 1979 or 1980, and full owners in 2006. Varine Carr assisted in the kitchen, eventually taking over the cafe. Though Ida Todd and Rosemary Johnson started the legacy of making delectable pies at the Shangri-La, it's Mrs. Carr who's perfected them and become so well known for them. 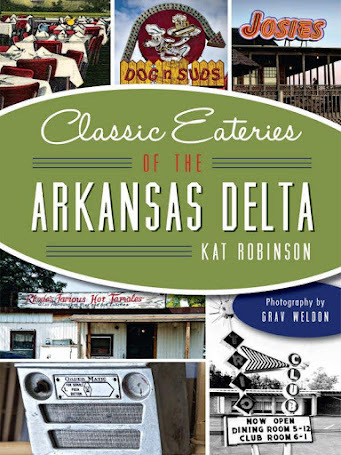 I've covered this place before, on my original first epic pie jaunt searching for the Best Pie in Arkansas for the Arkansas Times. 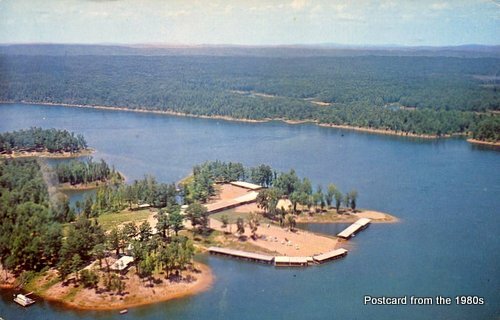 Since then, I've learned a lot more about the lay of the land, the lake and the resort folks who hold onto these slivers of lake-accessible property. 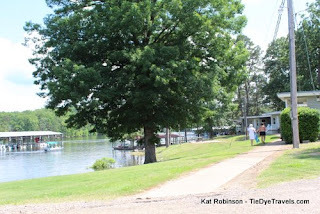 See, the Army Corps of Engineers tightly regulates the use of the shoreline, which is why most of your time on Lake Ouachita is out of eyesight of development, unlike nearby Lake Hamilton. 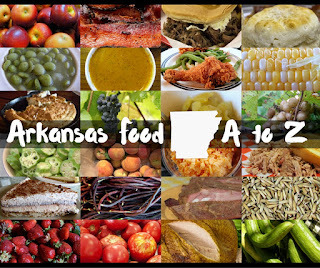 It's Arkansas's largest lake, and eight million people visit it every year. But I digress. First time I went, Grav had a grilled cheese sandwich and I had a burger and we shared a slice of pie. Blueberry. Amazing. This trip, though, I was driving solo. 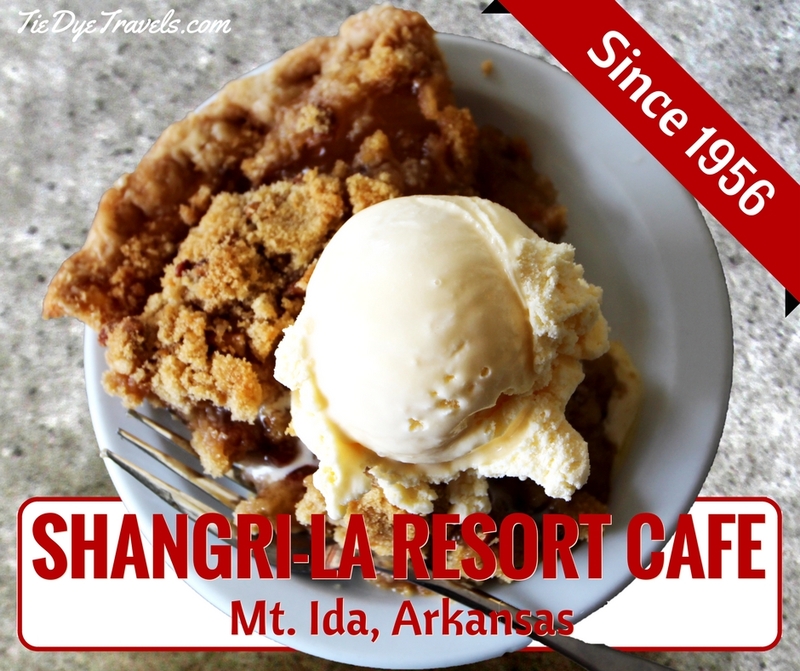 I was out and about doing some shots and research for the upcoming AETN special Make Room For Pie: A Delicious Slice of the Natural State with Kat Robinson, and I knew I had to include the Shangri-La. The resort is located on a peninsula that's about 20 miles from Hot Springs and almost as far from Mount Ida (though it has a Mount Ida address). 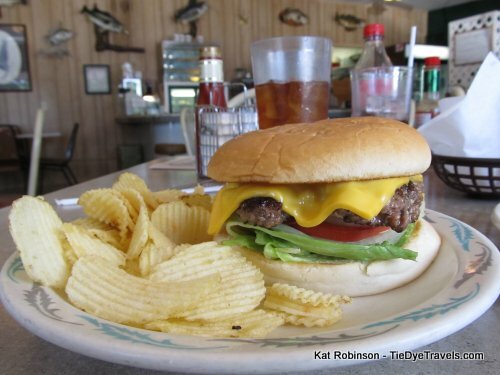 It's hard to miss the classic sign along US Highway 270 that shows you the way. Another mile of undullating roadbed takes you to the edge of the lake and a spot barely touched by time. Indeed, if it wasn't for the modern vehicles parked here and there, it'd be hard to discern it from photos from long ago. 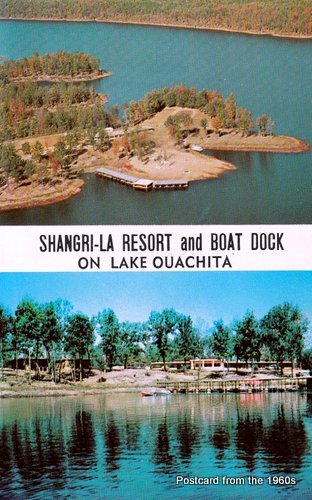 Postcards from years past show the same idyllic scene - a series of small cabins and a long single story motorcourt hotel spread along a peninsula into Lake Ouachita; a series of boat docks; lush vegetation of the forest separated from the deep blue waters of the lake by a tan strip of shoreline. The white and red aluminum awning that keeps the sun from shining directly into the cafe, the neon tubes over the red and white sign denoting the location of the cafe and office, the same angled aperture of windows overlooking the parking lot - little had changed since my visit in 2011 and I suspect little has changed in the myriad of years since the resort opened. 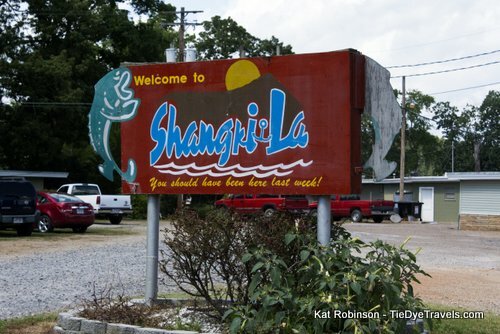 But that's what visiting the Shangri-La is like - it's a nostalgic wander down an asphalt lane to a different time, when heading to the lake meant losing complete contact with civilization. Yes, there's an old telephone in the lobby (but none in the guest rooms) but the cell signal is light and at one point in time not too long agi it was nonexistant. On this particular day, I pulled in hungry, somehow committing the sin of not eating breakfast before hitting the road (I had a LOT of locations to hit in one day). I knew I was searching for pie, but I also wanted something more substatial. There was a bit of a crowd checking out when I arrived right about 11 a.m. this particular Saturday morning. I wandered up to the counter as others were checking out, and I noticed right off the bat that the pie case was full. The counter was littered with hands in front of me - paying a bill, dining, cutting a pie. I looked up and saw Mrs. Carr. She was a bit busy. That's okay. My question would wait. One of the lovely waitresses looked up at me and smiled. I wandered out across the room and asked her if this naughty girl could go sit in the corner. She laughed and followed me over, handing me a single laminated menu sheet and taking my drink order. The restaurant's late breakfast rush was ending and tables were being cleared. I saw several ladies in Shangri-La shirts wiping surfaces, slicing pies and placing the plated pieces in the two pie cabinets. The special of the day was pork barbecue ribs, purplehull peas, cornbread... my mind was already wandering as my waitress gave me the rundown. See, I wasn't just thinking about how beautifully preserved this cafe was. I was thinking about hotel and motel culture and restaurants in general at the same time. 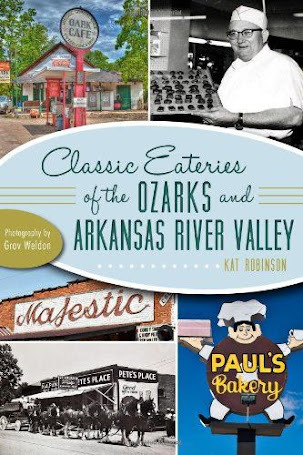 I was thinking about the research I'd been doing on the Hotel Goldman in Fort Smith, which has been beautiifully preserved in the Fort Smith Museum of History with photography and even menus from a bygone era. I was thinking of the particulars of dining while traveling and the sort of things that would be on the menu - like sandwiches of egg and olive, ham, cheese and jelly, goose liver and the like. So I ordered the closest thing to one of those and got the tuna sandwich. Grav on our visit in 2011. The details of the eatery weren't lost on me. As a handsome older couple came in, sat and talked at a table near the bar, I looked upwards and noticed the clock face actually set into a panel in the wall, with the numbers neatly arranged around it. I regarded the champion caught bass on the walls. I wondered if the pie cased were original. Everything, from the curved white chairs to the crisscross latticework near the wait stand, seemed so set in place. Someone needs to shoot a movie here. My waitress brought me the tuna sandwich - tuna salad with lettuce and tomato on toasted wheat bread with just a touch of mayo. I did not care that the tuna was likely not recently live-caught and overnighted or seared and served with some wasabi-lemon aioli or the like. I only cared that it was cool, tasty and, frankly, lunch. I even shoved a few rippled potato chips from the pile on the side into my sandwich. Tuna salad sandwiches are a remnant of my youth, too. Could I get more nostalgia-soaked? Why yes I could. 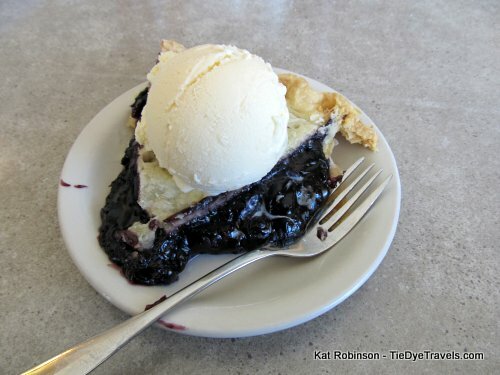 When my waitress brought me the sandwich, I asked her about the pies and she rattled off a litany - apple, cherry, peach, blueberry, Dutch apple, coconut, chocolate, caramel, peanut butter... there were so many, and I knew there were likely a dozen different sorts in that case. From what I understand, Mrs. Carr still gets up every morning and bakes those pies, 30 each morning, 30 pies that almost every day are gone before lunch is finished. I also hear her son Phillip also works on pies there. I asked my waitress which she'd choose. She said the best sellers were coconut, chocolate and Dutch apple. I noticed she said "best seller" instead of "favorite" - I know that trick, too. I chose the Dutch apple. "You want ice cream with that?" "You want ice cream with that!" she declared, and wandered back over to the counter while I ate my sandwich and watched. More slices were being prepared and plated ahead of the lunch rush to come. The couple who'd come in after I had were enjoying salads and ogling the steaks that had just been delivered to their table. I heard their quiet conversation. I smiled when I heard them talking about my camera and their suppositions on what I might be up to. Heh. I crunched down on another bite of potato chip-augmented tuna salad and watched some more. My plate was soon empty. My tea kept regaining its volume, and I realized my waitress had quietly kept filling it while I was thinking of other things. Soon my plate was gone too, and she was returning with a small plate that bore something of true and amazing beauty. Look, what I will tell you is that I was glad there were few to witness how quickly I inhaled this once I got my photos. After all, the ice cream was melting. It was almost embarassing, how I was both able to enjoy all of the pie but sadly left some of the molten ice cream on the plate. Well, I was wearing a nice scarf, and the last thing I needed to do was soil it with what might drip if I'd licked the plate. You'd think I'd never eaten before. Egads. I had four more locations to hit before returning home for the day, and none of them were within 20 miles. I knew I had to go. I allowed myself a few minutes to rest as a sliver of video was posted to taunt those who'd wander onto Facebook that day, then went to settle my bill. Mrs. Carr was behind the desk when I walked out of the cafe into the lobby. We struck up a quick conversation about kids, the internet and such and that's when I asked her about the duration of the resort, when she told me she'd been there since day one. Her smile looks just as fresh as it likely did that opening day. She gave me some tips on places to go digging for crystals before her attention turned to a guest coming in. I made a note and a promise to myself - I needed to spend a weekend away from the modern world. One day I'll stay at the Shangri-La and be an overnight guest and let myself be pulled back into that summer place along the lakeshore. But for now, I had to go. As I wandered out, two wet Labrador retrievers came up to me. "Had a good swim?" I asked them, these happy dogs, as their owner came up and let me know they weren't vicious. On the other side of the parking lot, three kids were riding on a golf car. Two of them were carrying meringue pies while the third was driving. Kids were in the pool a short distance away. There was a woman carrying a stringer of fish up from the docks. And the sun pressed briefly out of low-lying clouds like a photographer's flash. When you decide it's your time to go to the Shangri-La, avail yourself of this website's information. You don't have to be into fishing or even wanting a dip in the lake to enjoy this place. Just come ready to unplug and appreciate it for what it is - a slice of history where you can enjoy a delectable slice of pie. The Shangri-La Resort is located off US Highway 270 between Hot Springs and Mount Ida. It's open year-round but the restaurant is closed November 15th-February 1st. For more information, call (870) 867-2011. It is always worth the drive. In fact, after reading this article, we're making the trip today. Ila Green has worked at Shangri La for over 20 years and it's a real shame that she never gets any of the credit for the thousands of pies she has made for that restaurant. So for you to understand you should check a little further on your facts or who is actually in the kitchen. The pie you ate that day was most likely made by Ila. She is the Pie Lady. You need to try the onion rings next trip! Shangri-La has the best in my opinion! My father worked on the docks in the early years, then i put in between 15-20 years (sometimes part time) and now my son is third generation. Wonderful place!! I work there. Miss Ila come's in at 4:30 A.M. assembles the pies, but they ARE made by Mrs. Carr. Ila Green has worked there for over 20 years and she does put the pies together. Mrs. Carr and her son make all the fillings and pie crust. Ila puts the filling in the crust and puts the meringue on them and cooks them. She is a very dedicated worker along with all the staff there. 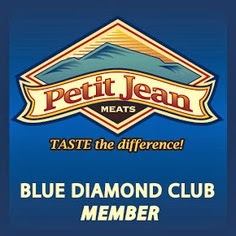 We love to eat there.